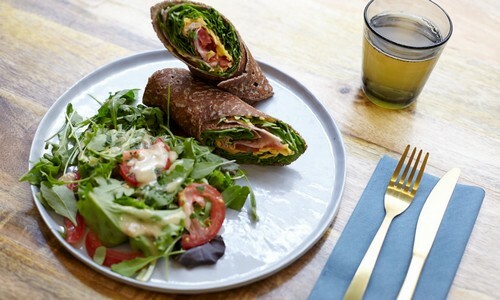 The Blün crêperie was founded by three friends, Mickaël, Nicolas et Jérôme, who had their hearts set on sharing their knowledge and love of healthy, organic, gluten-free and extremely tasty food. Contrary to the popular belief that only the Bretons could make good crêpes, these three guys are born and bred Parisians, but with the same passion and appetite for buckwheat pancakes and crepes made with wheat! The concept? A light wooden design with a Scandinavian feel that gives you a sense of well-being. The flour and organic cider are sourced from Brittany and they use fresh, organic fruit and vegetables to create delicious and original recipes. The restaurant’s signature dish: “Le Blün”, an organic, gluten-free galette made using buckwheat flour and fresh ingredients. As a Parisian, I would advise them quite simply to wander through the streets, to let themselves be guided by instinct and chance. There’s nothing nicer than getting lost in a city and discovering quaint side streets, small boutique shops and little restaurants off the beaten track. For the more adventurous, I’d recommend the secret parties in Paris’ catacombs. The atmosphere guarantees a thrill! Lodgis is a dynamic and innovative real estate agency in Paris, which has specialized in furnished rentals since 1999. Lodgis offers a simple, secure and efficient solution to finding the ideal property in Paris. Our website, available in 10 languages, provides you with more than 7.500 furnished apartments for rent across Paris and its nearby area, as well as unfurnished properties for rent, sale and rental management services.